Birmingham's poor form under new boss Gianfranco Zola continued as Brentford came from a goal down to beat them. Lukas Jutkiewicz took advantage of poor defending to poke the Blues in front. The Bees came to life after the break as Scott Hogan fired home from inside the box before then missing a penalty after being brought down in the box. David Davis then deflected a Ryan Woods free-kick past his own keeper and substitute Nico Yennaris fired in a third for the hosts from 25 yards. 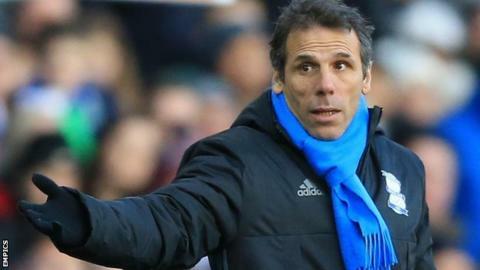 Since taking charge of the West Midlands club, Zola has claimed just one point from his four matches in charge. Blues should have taken the lead early on when David Cotterill fired over when through on goal and Che Adams then shot wide from 10 yards for the hosts. They finally went in front as a stumble by Bees defender Harlee Dean allowed Jutkiewicz the chance to fire the ball in off keeper Daniel Bentley. Brentford levelled when Hogan fired in from Romaine Sawyer's deep cross and he should have made it 2-1 when given the chance to score from the spot. But poor defending by Birmingham allowed Woods' free-kick to hit Davis and Andreas Bjelland on its way in and the Bees scored a third late on when the hosts failed to close down Yennaris. "This game is the most disappointing since I took over. "We made mistakes and that is the consequence of what happens. If you do not control the tempo of the game the opposition will take over. "That was the big problem and the disappointment for me was not to have control in the second half. "I thought the first half was excellent when we produced some good football and scored a very good goal. But it is this fragility we need to improve." "I told the players at half-time that although we were a goal down I didn't want to just get back into the game - I wanted them to win the match. "We felt that if we could put pressure on them there would be an atmosphere here at Birmingham - they've had a change of manager and the team is in transition - and if we could get the crowd on their backs it would certainly help us. "This occurred and the players operated with a lot of belief and deserved the three points." Match ends, Birmingham City 1, Brentford 3. Second Half ends, Birmingham City 1, Brentford 3. Attempt missed. Jonathan Spector (Birmingham City) right footed shot from outside the box is too high. Assisted by Greg Stewart. Substitution, Brentford. Philipp Hofmann replaces Scott Hogan. Attempt missed. Jonathan Grounds (Birmingham City) header from the centre of the box misses to the left. Assisted by Greg Stewart with a cross following a corner. Corner, Birmingham City. Conceded by Harlee Dean. Corner, Birmingham City. Conceded by Andreas Bjelland. Goal! Birmingham City 1, Brentford 3. Nico Yennaris (Brentford) right footed shot from outside the box to the top right corner. Assisted by Andreas Bjelland. Attempt missed. Michael Morrison (Birmingham City) header from the centre of the box misses to the left. Assisted by Greg Stewart with a cross following a corner. Attempt blocked. Viv Solomon-Otabor (Birmingham City) left footed shot from the right side of the box is blocked. Assisted by Che Adams. Substitution, Brentford. Konstantin Kerschbaumer replaces Lasse Vibe. Attempt missed. Greg Stewart (Birmingham City) left footed shot from outside the box misses to the right. Assisted by Maikel Kieftenbeld. Substitution, Birmingham City. Greg Stewart replaces Robert Tesche. John Egan (Brentford) wins a free kick in the defensive half. Own Goal by David Davis, Birmingham City. Birmingham City 1, Brentford 2. Attempt missed. Andreas Bjelland (Brentford) header from the centre of the box is close, but misses to the right. Assisted by Ryan Woods with a cross following a set piece situation. Corner, Birmingham City. Conceded by Josh McEachran. Ryan Woods (Brentford) wins a free kick on the left wing. Substitution, Birmingham City. Maikel Kieftenbeld replaces Jacques Maghoma. Corner, Brentford. Conceded by Tomasz Kuszczak. Ryan Shotton (Birmingham City) is shown the yellow card for a bad foul. Penalty Brentford. Lasse Vibe draws a foul in the penalty area. Penalty conceded by Ryan Shotton (Birmingham City) after a foul in the penalty area. Corner, Birmingham City. Conceded by Daniel Bentley. Attempt saved. David Cotterill (Birmingham City) right footed shot from outside the box is saved in the bottom left corner.